I need you to meet someone who will probably change your surfing life. He definitely changed mine. I found Rob Case, surfing paddling expert, quite accidentally. He came up in a Google search my boyfriend did when I was devastated about my paddle being too weak to catch any waves. Next thing you know, I’m sitting enthralled by a 45 minute webinar of the sort of technicality I didn’t think could possibly exist in surfing. Four quadrant paddling? S-stroke? Catch phase? I felt like taking notes! Don’t take my word for it, though. Check out Case’s analysis of what makes Slater’s paddle so powerful and you’ll see what I mean. Meet you on the other side. You might want to grab some paper and a pen. Kelly’s head does not sway from side to side. This may seem a bit simple, but it makes a profound impact on his speed and efficiency in the water. If the head sways one way, there is another part of your body that reacts to that motion. This has been studied for decades in swimming, and the same principle applies to surf paddling. When you sway your head and it moves off the vertical axis of your body, something on the other side of your body moves the opposite way. Your head moves left, your feet will move right. This increases your lateral profile, making more drag. We don’t want this! Instead, keep the head still and rotate your body around an imaginary metal rod going down your body from head to tailbone. This is a key technique in maintaining lateral balance, and thus reducing drag. This technique that Kelly uses is twofold. It impacts both his ability to slide smoothly through the water with little drag and also impacts the amount of propulsion he is able to get out of each stroke. What he does has to do with his hand’s entry into the water – he keeps his elbow high when his hand is about to enter the water. Again, I know it seems really simple. But here’s the deal why this works so well. When the elbow enters high, then it stays high when you reach the front propulsive phase of the underwater armstroke. Huh? In other words, it helps keep his hand and forearm in a vertical position from the start of his stroke. When your hand and forearm are vertical, then you are able to hold the water and propel yourself forward with a greater surface area for a greater length of time. The last tip is that Kelly uses is a slight roll from rail to rail around that imaginary metal rod (See tip #1) so that he can recover his arm forward. What this does is that it first helps the recovering arm to be led by his elbow instead of his hand, which is super useful in setting up the previous techniques. Second, it prevents any dragging of the hand in the water which is slows you down. Third, there is a side benefit as well that will help increase the stroke’s power. Let me explain the power benefit really quickly. There are two descriptions of paddling that I use in reference to the rolling from rail to rail. There is a hip driven stroke, and there is a shoulder driven stroke. Both are useful in different situations and I distinguish the two because of where the roll is being initiated. I’m sure just based on the names of each of these you can figure out what each one is. The hip driven stroke is initiated at the hips and the shoulder driven is initiated from the shoulders. In both scenarios, we use our core and in both, the counter-rotation of the body sets us up for a stronger and more powerful underwater armstroke. It lines us up so that we are using our big powerful paddling muscles in our pectoralis major and latissimus dorsi as opposed to our stabilizing rotator cuff muscles, which we want to avoid using for power, and the rotating motion acts like a spring that is wound up and then released. (See what I mean?!) Case routinely analyzes professional surfers’ paddles. When I asked whether he’s ever learned something new from them, he answered that his analyses yield validation more than anything else. So how does someone get to know so much about the mechanics of paddling? When Case realized life was leaving him less and less time to exercise and play in the water, he decided the small amount of time he did have to condition needed to be used more efficiently. A professor by trade, it was only natural that Case sought out any information that could help with his transition to an uber-optimized water workout. 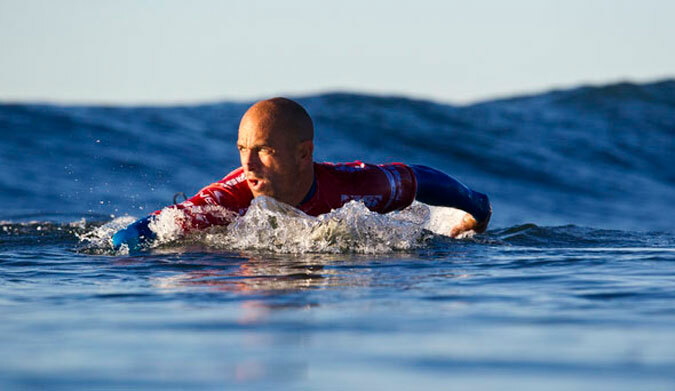 Case discovered surfing physiology research studies in medical journals performed by Australian universities (which makes sense, since Australia is as serious about its surfing as Europe is about its soccer). Armed with technical, Ph.D. level knowledge, Case created a unique pool workout intended to get him in the best possible shape for water sports as efficiently as possible. But it didn’t look anything like doing laps – it had him doing intervals in the water, then jumping out to do all sorts of different exercises on the deck, and then back in the water. It definitely attracted more than a few raised eyebrows. Eventually, other pool patrons had to ask Case why he was doing downward dogs in sopping wet swim trunks. That’s how XSWIM was born. With XSWIM classes offered by Case at his local YMCA, surfers took up the water fitness classes, with the obvious end goal of improving at surfing and catching more waves. It didn’t take Case long to realize, however, that no matter how good your fitness level is, you aren’t going to get far surfing if your paddling technique could use some serious improvement. Enter Surfing Paddling Academy. Surfing Paddling Academy focuses on proper technique – again with a data-driven technicality heretofore unprecedented in my (admittedly short) surfing career. Many of Case’s Surfing Paddling clients are busy professionals with limited time for recreational surfing looking to improve the experience for when they do make it out, but his knowledge and system are sophisticated enough to attract WQS hopefuls. The best part is he makes his system available for everyone online, with detailed videos, webinars, workouts, exercises, etc (Links at the end of the post!). I smile inside when Case explains how he designs his surfing paddling workouts. They are thoughtfully created to integrate into a regular surf session. Catch a wave, and on the paddle back out, do the the paddling exercises. To the casual observer, it looks like you’re simply paddling, and you avoid any stigmatization or judging from the old-school locals. The more we talked, the more it seemed to me that Case is like a surfing prism, if you will, unpacking a singular lifestyle-defining activity into a dazzling array of individual aspects that can each be examined for new insights into how to better understand and enjoy surfing. I left our conversation with exciting new surfing wisdom, and with an overwhelming desire to grab my board and go…paddle! To see the free training video that explains the above tips and get a feel for the kind of technical details and research-based knowledge Case provides, click here. To see more videos of Case analyzing pro surfer paddling, check out his Youtube channel. And here’s the Surfing Paddling Academy and the XSWIM websites, for good measure.